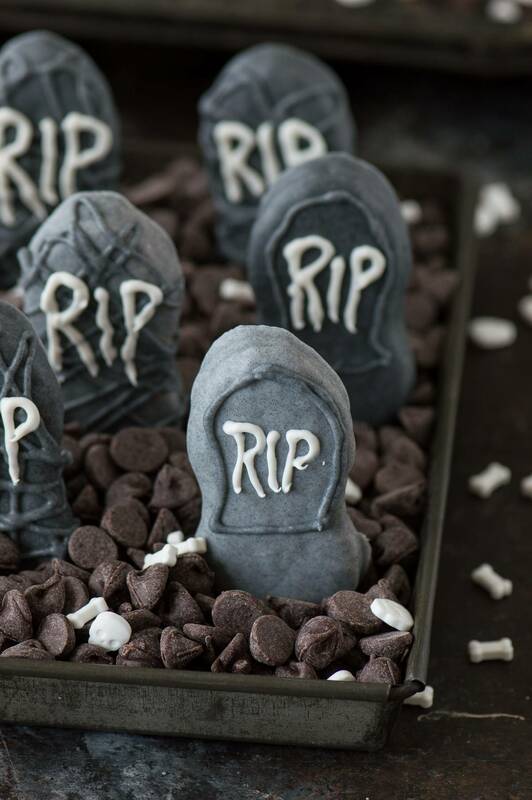 An easy halloween treat – Nutter Butter Tombstones! With a simple idea of how to display them in a graveyard! 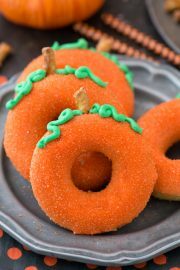 Have you ever searched for nutter butter treats on pinterest? 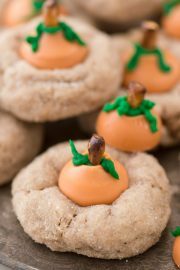 So many fun ideas come up! QUICK VIDEO SHOWING HOW TO MAKE NUTTER BUTTER TOMBSTONES! 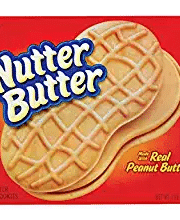 The classic peanut shape of a nutter butter is pretty versatile when it comes to turning it into a cute figure. 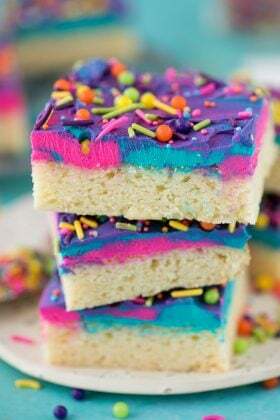 All you really need are a few bags of various colored candy melts and a pack of nutter butters and you’re set to create something cute! I reference colored candy melts quite a bit on my site, but I’ve never explained what they are. I figured everyone knew, but I was talking to my mom the other day and she wanted to know how I got green chocolate to make these frankenstein pretzels. Wilton, the cake and decorating supply company, makes colored chocolate melts (usually called candy melts) in tons of different colors. 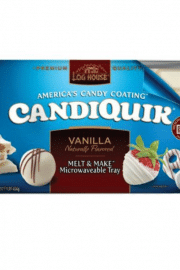 I’ve been able to find the Wilton candy melts at Walmart, Party City, and Meijer. I’ve noticed that Party City is usually well stocked with Wilton products but if I can’t find what I’m looking for there, I can usually find it at Walmart. Wilton doesn’t carry gray candy melts, but you could combine some white candy melts and black candy melts to create gray. But I learned something that I think is super cool and it all happened by accident last year when I was making tombstone cupcakes. 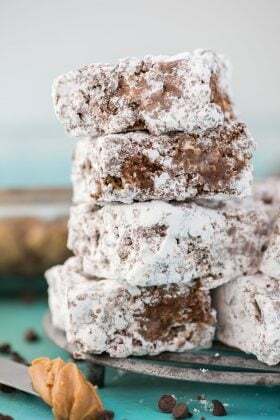 Instead of using the wilton candy melts to create a gray color, I used white chocolate almond bark and black gel food coloring and the result was an awesome speckled gray color because the gel food coloring doesn’t fully absorb into the almond bark. So I used that method to make these nutter butter tombstones and I love the look of the speckled gray color. Kind of makes the tombstones resemble actual rock. 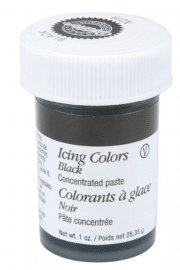 It was also very easy to create 2 different shades of gray by adding more black gel food coloring after I reserved a portion of lighter gray in a separate bowl. So there you have it! 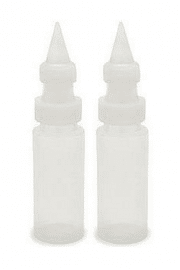 2 different methods for creating gray chocolate. 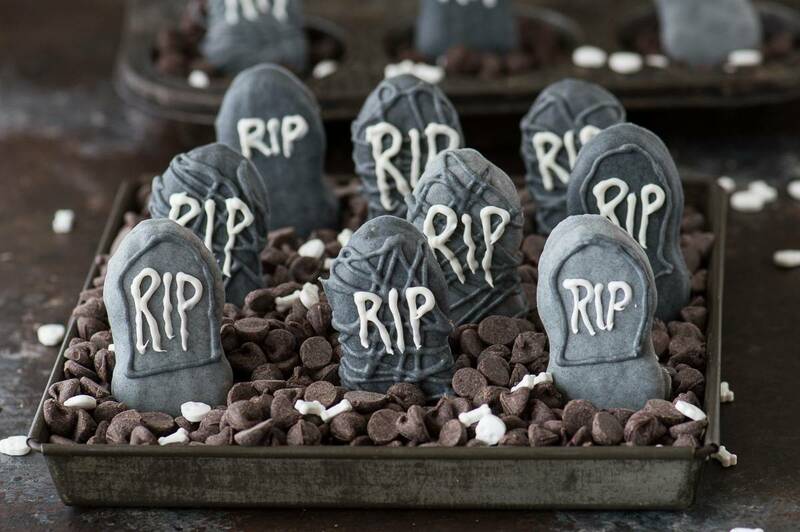 I really wanted the nutter butter tombstones to actually look like tombstones so I came up with an easy way to display them – in a tray filled with chocolate chips! I also added some skeleton bone sprinkles (also Wilton brand) to complete the look. 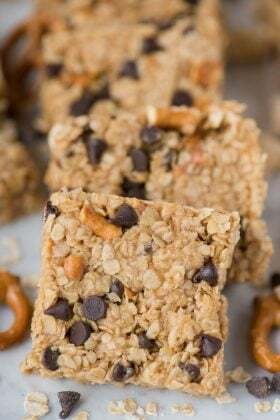 I used an entire 24oz bag of chocolate chips to fill an 8 inch square pan and the pan I used was pretty shallow, so plan accordingly and buy a few large bags of chocolate chips, you can always use the chocolate chips to bake with later. 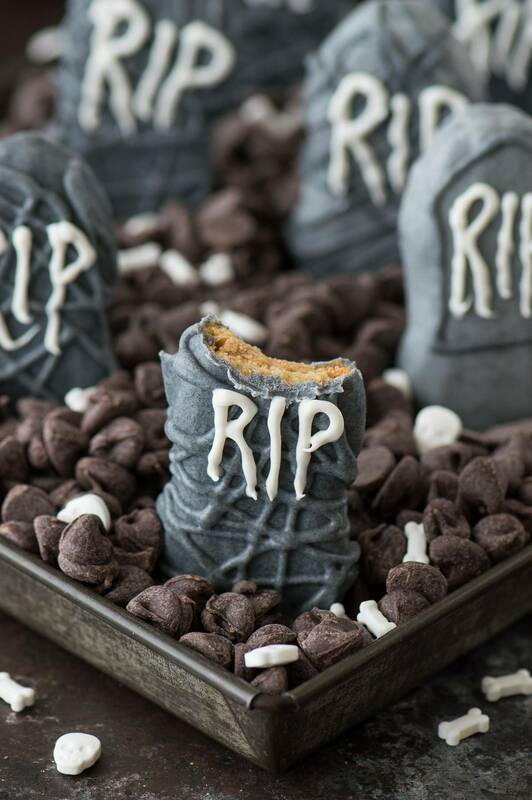 An easy halloween treat - Nutter Butter Tombstones! With a simple idea of how to display them in a graveyard! 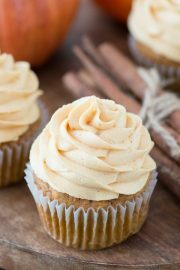 Open the package of nutter butters and line a baking sheet with a silicone baking mat or parchment/wax paper. Before you melt the almond bark, reserve a small amount to be melted later and used for the “RIP” lettering. In a small pot over low heat, begin to melt the white chocolate almond bark with about a tablespoon of vegetable shortening. Stir occasionally until the chocolate is melted. 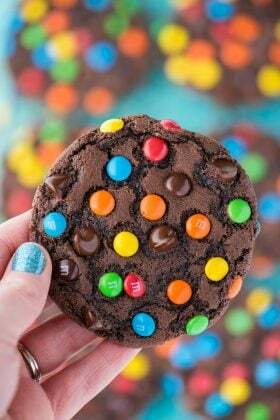 Stir in a small amount of black gel food coloring, adding more if needed until you get your desired color. Once the chocolate is ready, place one nutter butter in the pot at a time, spooning chocolate over it and using a fork to remove it from the pot, tapping the fork against the pot to remove the excess chocolate. Use a toothpick to help transfer the nutter butter from the fork onto the lined baking sheet. Repeat this process, dipping as many nutter butters as you like. 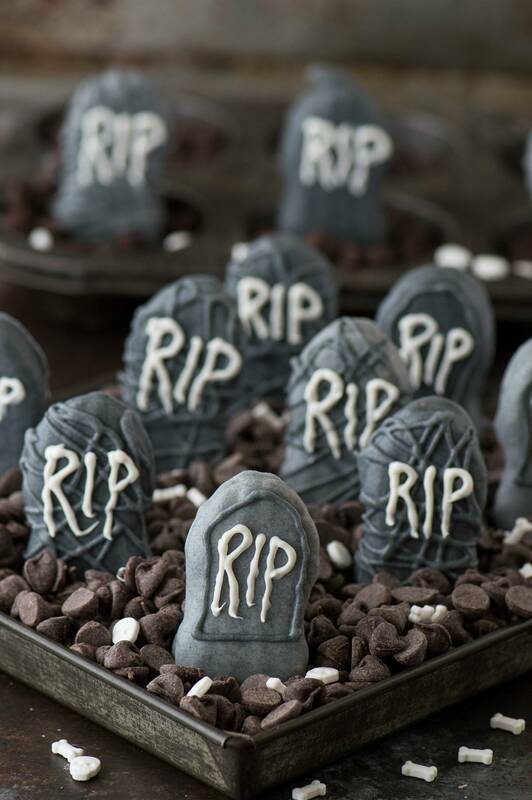 You can also add more black gel food coloring to the chocolate to create different shades of tombstones. Allow the chocolate on the nutter butters to set before moving forward. You can place the baking sheet in the fridge to help speed up this process. Now you have a few options, you can leave the tombstones plain and simply write “RIP” on them or you can add some detailing like I did. On some on the tombstones I drew criss-crossing lines for a spooky affect and on others I drew the outline of the tombstone. I used leftover gray chocolate and a squeeze bottle to add on those details. 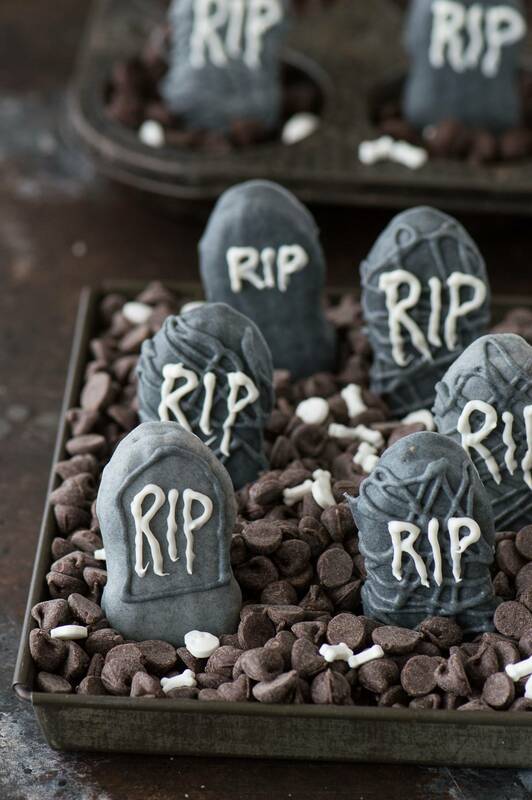 If you choose to add details, allow that chocolate to set before adding the “RIP” lettering. In a small pot over low heat, melt the reserved portion of white chocolate almond bark along with a small amount of vegetable shortening. 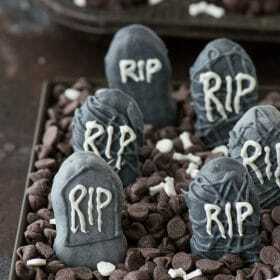 Once melted transfer the chocolate to a squeeze bottle and add “RIP” to each tombstone. Allow the chocolate to set. To assemble the graveyard, fill a pan with chocolate chips. Move the chips around to help get the tombstones in place. Sprinkle skeleton bone sprinkles over the graveyard. The amount of nutter butters and chocolate needed will depend on how many you'd like to make.